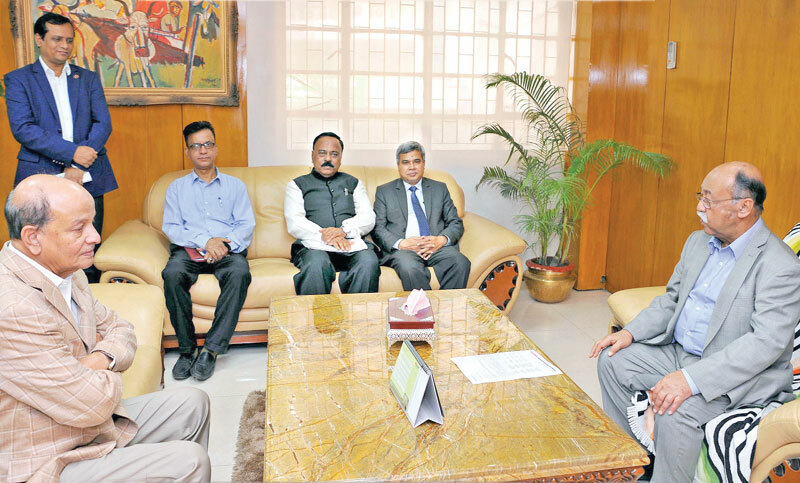 Industries Minister Nurul Majid Mahmud Humayun exchanges views with visiting trade delegation of The Bengal Chamber of Commerce and Industry of Kolkata at industries ministry office in the capital on Tuesday. State Minister for Industries Kamal Ahmed Majumder was also present on the occasion. An electronic board shows the index chart at the Sao Paulo Stock Exchange (B3) in Sao Paulo, Brazil on Monday. Brazilian stocks topped 100,000 points for the first time Monday, on hopes for progress in President Jair Bolsonaro's promised pro-market reforms. The Ibovespa, the country's main index in Sao Paulo, has increased by more than 13 percent since Bolsonaro took power on January 1. A worker watches a truck transferring imported sulphur at a port in Nantong in China's eastern Jiangsu province on Tuesday. China's energy production maintained stable growth during the first two months of the year, the National Bureau of Statistics said Monday. People look out from the observation deck of the Sands SkyPark at the Marina Bays Sands hotel and resort in Singapore on Tuesday. Paris has climbed to the top of the world's priciest city for expatriates, tied first with Singapore and Hong Kong according to a survey on Tuesday that named the capital of strife-torn Venezuela as the cheapest. South Bangla Agriculture and Commerce (SBAC) Bank Additional Managing Director Mostafa Jalal Uddin Ahmed opens an ATM booth of the bank on Hasnabad branch premises at South Keraniganj on Tuesday. In this file photo taken recently, a man walks past a Dia supermarket in Madrid. Shareholders must decide on Wednesday who they trust to bail out Spain's Dia Group supermarket chain in great difficulty. Russian billionaire Mikhail Fridman's holding company LetterOne made a buyout offer for the group in February. An employee inspects machines for the production of bitcoins and litecoins at the "CryptoJuniversóe" mining centre in Kirishi, Russia. Social Islami Bank Managing Director and CEO Quazi Osman Ali speaks at a training course on ‘Investment Management’ at its training institute in the capital recently. Mutual Trust Bank Managing Director and CEO Anis A Khan and Guardian Life Insurance Managing Director and CEO MM Monirul Alam exchange documents after signing an agreement on insurance facilities at MTB Centre in the capital recently.